Our mission is to develop fine art photography in the Tampa Bay area through collaboration, education, and exhibition. Working together with talented photographers around Tampa Bay, we can create a permanent footprint and mark this moment in history with our creativity, skill, and unique perspectives. As artists, we choose to share our journey with each other. Through monthly meetings and events, we are constantly challenging each other and ourselves to explore and reinvent ourselves on the way to discovering the artists we are. Fine art education is the cornerstone of our society. Through studying the work of masters, sharing experiences and knowledge among ourselves, and volunteering our work for peer review and criticism, we grow as true artists. With five annual shows, 12 monthly showcases in a permanent exhibit, and participation in the dozens of other local art exhibitions, we help our artists gain the experience they need to develop into mature, validated, and recognized artists. Access online information, resources, and services only available to members of our society. Click to sign into your account or to quickly access information about submissions and more using the links below. 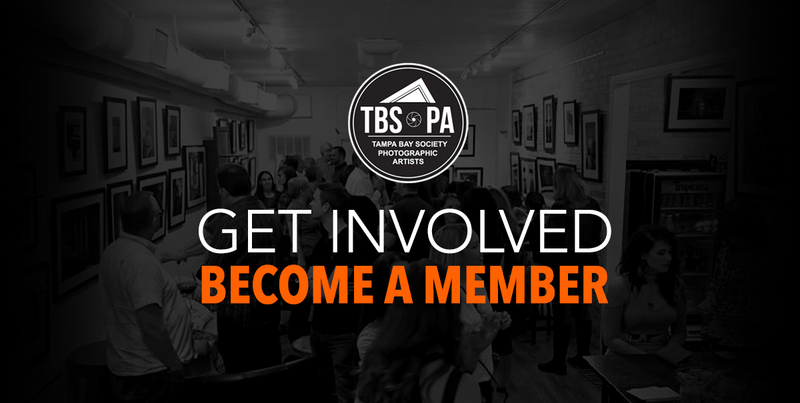 Our society welcomes participation from artists, photographers, galleries, sponsors, and art lovers from anywhere in the Tampa Bay area. Join us as we make a mark in Tampa Bay's fine art history and discover amazing talent from our own community. Receive updates to your inbox about artwork, programs, events, and more before the general public. TBSoPA is a nonprofit corporation in the State of Florida. Our artist build relationships together through their mutual interest to collaborate in unity and an entrepreneurial spirit. © 2016 - 2019 Tampa Bay Society of Photographic Artists - All Rights Reserved.